Today in my orkut scraps, i received two scraps from a devotee which i felt worth mentioning on this blog. The first one he sent and i read first is below. His message was in Hindi script as one can read below. It is yet another wonderful example of Shirdi SaiBaba taking care of His devotees and guiding them in dreams. Sai Baba used t guide so may devotees in dreams while He was in physical form and even after leaving the physical form, in 1918 A.D. Sai Baba continues to do the same. The devotee and an orkut friend who wrote the following experience is one of the lucky devotees who gets the guidelines from loving and caring SaiBaba in dreams. The devotee narrates his experience. His brother is i the business of books, which is named after Saibaba. Like every new year, this year also his brother made a calendar with Sai Baba pictures. When he visited his brother's house on seeing the calendar he asked his brother that why he published the calendar with the pictures of Sai Baba sitting on the silver throne rather than the pictures of Saibaba sitting on the golden throne (which was recently presented to Saibaba from two devotee brothers). ( I feel the devotee might have been a little dejected on seeing the pictures on Saibaba on silver throne rather than the gold one). In the night when the devotee slept he had a dream in which, Sai Baba said to him that the one who is sitting on the throne is far more important than the throne itself. Wonderful experience by the devotee. Sai Baba's love and care for him is seen quite clearly. Sai Baba wants him and all of us that Sai Baba is more important than anything else. Our attention should be on Him and His love and grace than anything else. When we talk about Sai Baba's leelas, our mind should be more on SaiBaba than the leelas(ilusion). Sai Baba is real and eternal, everything else is illusion and not eternal. Saibaba's love and grace will transform us from sand to gold as Sai Baba said to His devotee Abdul Baba, "Main tereku mitti se sona bana diya." The one who can transform us from dust to gold, will bring us closer to "Malik"(God) is far more important than the illusory material wealth. We should not be much attracted to the material wealth, rather than attracted to the eternal, the love, the grace personification Sadguru Sri Sai Baba. हेल्लो अल्पेश जी, कैसे है आप? कल मेरे साथ kutch हुआ जो मैं आपके साथ शेयर करना चाहता हूँ, मुझे आशा है आप इसका जवाब देंगे! मेरे बड़े भाई किताबों का व्यापर करते है, जोकि साई बाबा के नाम पर रखा गया है. हर साल कि तरह इस साल भी भैया ने साई बाबा के कैलेंडर प्रकाशित किये. में कल अपने भैया के घर गया जहाँ पर मैंने वह कैलेंडर देखा, और देखते ही मैंने कहा "अर्र्रे भाई यह तो साई बाबा का चांदी वाला पुराने सिहासन के फोटो वाला कैलेंडर है, तुमने नया सोने वाला क्यों नहीं प्रिंट करवाया" इतना कह कर मैं अपने घर चला गया. रात को जब मैं सो रहा था तो मैं हैरान रह गया "मैंने सपने में साई बाबा को देखा जो मुझे यह बता रहे थे कि किसी इंसान के सिह्नासन से ज्यादा महाव्त्पुर वह इंसान है जो उस पर बैठाता है" मैं हैरान और डर गया. क्या ऐसा संभव है? वह साई बाबा का क्रोधित रूप था, जिसके बाद मुझे रात भर नींद नहीं आई..... मैंने उसी समय बाबा से माफ़ी मांगी, लगता है मैंने kutch गलत कह दिया था? "Sometimes, He scolded the devotees, at times, He looked softer than wax, a statue of peace and forgiveness. Though He seemed to shake with anger and His red eyes rolled round and round, still, He was internally a stream of affection and motherly love. Immediately, He called out His devotees and said, that He ever angry with His devotees; that if mothers kicked their children and if the sea turned back the rivers, He would neglect the devotees' welfare: that He, the slave of His devotees, always stood by them, and responded to them, whenever they called upon Him, and that He always longed for their love"
I don't need to say more on the devotee wondering if Sai Baba is angry with him. If i would have been in your place i would have been filled with gratitude for coming Saibaba's love and care, for His coming in the dreams to guide, and showing anger towards my possible mistake only to take it away from me. I would really like to see more devotees sharing their experience with SaiBaba on this blog so that, more devotees can know about Sai Baba's tremendous love and care for His devotees. Devotees can write the experience in comments or send them at my email id , so that those experiences can be published individually. I definitely want to share this wonderful experience with sai baba. One day myself and my husband got into a big fight in the afternoon after the lunch. I lost my appetite for dinner I did not eat food that night. After a while I got very hungry, but did not eat food because of my strong ego. I could not sleep the whole night with stomach paining in hunger. I fell asleep in the early hours and I saw a dream. I was sitting in room with my husband, and sai baba came to me and offered a spoonful of curd rice as prasad. I ate the prasad and to my wonder I was not hungry anymore. He asked if I was still hungry and offered me more curd rise, but I said no. I was so delighted and happy to see baba in my dreams. He definitely cares about his devotees every moment. Baba came in my dream. I dreamt that I saw a life-sized picture of him. And then suddenly the picture moved and Baba blinked his eyes. He then smiled at me and seeing my surprise, he laughed, but not unkindly. He then came to me and talked. I don't remember what exactly he said, but it was something like, "Your friends came to see me." I said, "I am sorry, Baba, I could not come to shirdi to meet you." He opened his arms wide to embrace me and said "That's all right. I am not angry with you." And then he hugged me. I woke up immediately after that. The dream was so vivid, it felt almost real. And baba looked so beautiful. 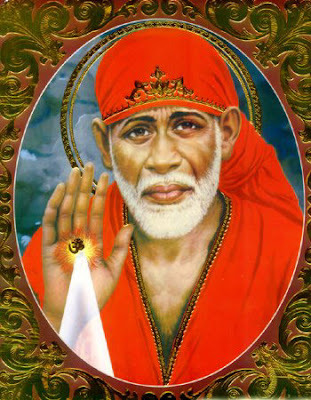 Great to read your all the comments of the fortunate devotees who had the dreams of Sai Baba. Yes Baba is caring and loving. He appears in so many devotees dreams and guide them and let them know that He is with them, always. Even i would like to post 1 event. One day my mother slipped from stairs and injured her ankle.Actually it should be a serious one but somehow she had a minute injury.The next was Thursady and mother was worried about the pooja because she is experiencing pain in her ankle. She thought she cannot perform baba's pooja the next day. That night Sai baba came to her dream and sat beside her and consoled her.The next she was fine and having only little pain. She does not eat anything without offering to sai baba. Everyday she offers some eatables in "Tulsi kundi" and the birds or some animals come and eat it. I would like to share a dream that I had last night about Shirdi SaiBaba. I was coiled up by a green snake. Suddenly Sai baba comes and helps me out! To dream of a snake is ominous or not, I am glad that he was there to save me. First of all the Experiences mentioned here are really lovely,I al so thank baba for all his help,he has helped me a lot. I LOVE YOU Baba,be with me,always keep ur hand on me. Around 2 years ago, I went through a very bad phase. My marriage was on rocks, I was far away from my family (I used to live in the US with my husband)and there were too many other problems as well. Nothing seemed to go right. At that time my mother once told me that everytime she and I discussed a problem, she would see Sai Baba's palkhi. (the palkhi procession which goes to Shirdi). I did not give it much thought. We had faith, but we were never Sai Baba devotees. Ultimately, the marriage ended, I returned to India and took up a job here. Around that time, I dreamt of Sai Baba. He did not say anything. First the palkhi incidents, now this dream...My mother and I visited Shirdi...A few days later, my mother also dreamt of Sai Baba. This was more than a co incidence. Maybe Baba was trying to give a message, or maybe he just felt bad for us and wanted us to know that He's there. We have both become his devotees. I really consider it a miracle. Now life's much better...I'm at peace. My career is on the right path and in general things are getting sorted out. We visit His temple here and once in a while go to Shirdi. We feel that He's there to help and guide us. BABA please help me i am Facing this problem...our parents are not agree for our relationship please baba koi miracle dekhiyo...sab problems solve hojaye. in a dream i saw that i am seating with baba & saluting babas feet. baba asked me what are you doing these days. i told baba that i practice meditation daily. baba told me do more. i too had a drean in which i was falling on a road full of stones and baba was guiding me not to worry and move ahead i am with you. my second dream just yesterday that i was visitinf baba's temple and he was sitting in his throne after darshan i got karela and kundru , neem as prasad not by baba but some vendor. I saw a priest in my dream and he asked me to offer bread with oil applied to a dog and then my brother will be well. I don't know if it was Sai Baba as i am looking forward for Sai baba to come in my dreams. You should do as prescribed in the dream (offer bread applied with oil and give it to a dog). Sai Baba gave a similar remedy to a devotee to offer some specific food to a dog near Maa Laxmi temple, to get rid of malaria and it worked. bt one thing i am still waiting for, baba still didnt came in my dreams..
baba sorry fr all that i did wrong. One Thursday morning my sister asked me if could come to baba temple with her,i said i am a devotee of goddess kanakadurga not baba. When i slept that afternoon i had a dream in which i took a friend to baba temple as he was ill.
Having realized baba,i went to temple that evening with my sister. I WOULD LIKE TO SHARE MY EXPERIENCE HERE. I AM A VERY HAPPY GO LUCKY GIRL AND PRAY VERY LESS. ONE NIGHT I HAD A DREAM, MY FAMILY ( MY FATHER MUM AND BRO) AND I WENT TO A CAVE LIKE PLACE WITH LOTS OF STONES AND THERE I SAW BABA. THERE WAS A SMALL LIGHT LIT IN A LAMP LIKE. I FEEL I WAS LIKE A KID IN FRONT OF HIM. HE PLAYED WITH ME AND REALLY CARED ABOUT ME. HE TOLD ME HE WILL BE THERE FOR ME ALWAYS. THE NEXT DAT I WOKE UP AND TOLD MY MUM ABOUT IT. SHE EXPLAINED TO ME WHO IS BABA AND FROM THEN I WORSHIP HIM TILL TODAY. HE HELPED ME ALOT IN MY LIFE. I WILL ALWAYS BE HIS DEVOTEE. OM SAI RAM! Baba I m very sorry i could not visited your temple after i wished for something and that has been fulfilled. Please forgive me baba I think of it every other day but not able to manage to go to your temple. Please give me a chance, i'll never make you upset. Good to read all your experiences. I started writing Shri Shirdi Sai Baba's name everyday. I wrote his name SAI for 1 crore times. I started that book on DUSHEERA - 6 Oct, 2011 being Thursday. I finished writing that book on 21 st December 2011 also being a Thursday. Once you are done with the book, offer food to people on Thursday. Just a day before finishing the book, i.e on Wednesday night I realized that the next Thursday is with Vishaaka Nakashtra (thats my birth nakshatra). According astrology, any work done with ones birth nakshatra falling on a Thursday is auspicious. Secondly, I finished that book in 78 days = 7 + 8 = 15. 1 + 5 = 6. 6 is the lucky number for librans. I simply love Sai baba, his name itself strengths me and make my life easier and smoother. Please consider yourself very lucky if you have Shirdi Sai Baba in the dreams. Sai is always there for us, so you dont have to interpret. Be Happy and Lucky that you have got and leave all your interpretations and worries to him. Plz read sai satcharitra...In this book u can find the life teachings of baba & his wonderful leelas. I don't know th menaing of seeing Gods in dreams but I saw saibaba couple of times in my dreams and I did navguruwar vrat . After that I stpeed seeing him in dreams. Later staterd seeing all the other gods. I am so scared of seeing gods in dreams. Because once in a while is fine. But seeing different gods all the time is a bit scary. I am not doing any thing wrong nor cheating ay one. Then why do I see so many gods in dreams . If i don't see gods, atleast I see temple , flowers etc. Is this good sign or Am I owed any pujas and forgot to perform I dont know. I am so scared. Seeing Sai Baba and other forms of Gods is very good sign. Also seeing temples and flowers. Why should you worry about it. You should be thrilled. From last two days I am seeing saibaba, durga maata and shanmuk in my dreams again. Only statues . I don't know if they want to tell me something. Seeing forms of Gods and Goddesses or their statues is considered a very good sign and something to be rejoiced. If they want to tell something they will, otherwise you are getting their darshan, So feel comfortable. I see sai baba in my dreams very frquently but whenever I am in great tension, he definitely come to see me in my dreams. I feel so lucky to see him in dreams. One small story when I read Satcharitra . I did this for 5 days and i was on bench for almost one month that time and requested baba wholeheartedly with great tension.If I don't get pjct within that month I should vacate my apt and go to my brothers house which I don't like to go in this situation but for vacation I always go there. You don't believe last day I got call from Satyam Computers to join in one of the project in SFO without any interview. I was surprised and shocked and happy and that day I saw miracle of Baba with my eyes. what else to say about baba . That is blessing of Baba. He will give everything what his devotees need. Just pray whole heartedly. I have done sai baba parayanam 2 times till now. Both the times I saw baba in my dreams. The first time "I was standing and praying before baba's statue wishing something then Baba blinked his eyes with a lite smile.." What does it indicate.. Here my doubt is Running away from Sainath releasing my hand is good or not what does my second dream indicate..I felt so upset as i ran away from him when he caught my hand. Can any one help me solving my queries..? Baba's coming in dream is very good. Baba has been coming in dreams of so many people dreams and have helped them. It happened a lot while Baba was in physical form. It happens after his Samadhi. I think you should develop more love with Baba. There are many ways, like reading Sai SatCharitra and His stories, Naamsmaran, worshiping him, or just watching His picture with love and devotion. I saw baba Abhisheskam with milk in my dreams. I felt so happy. action of sai has a complete meaning. You need to wait to see the effect. Sai is the most kindest and Father of Poor and down trodden. My Humble Salutations to Sai, the Beloved Father. had dream of swami, asking us to massage his feet, feel so blessed to dream of swami.